What happens when you take the Classic City Knights, eight boys from one of the poorest counties in the United States, to the small village of Kutaber, Ethiopia? Poverty is redefined and identity is reassessed through an empowering transformation. One look at the striking scenery along the cliffs of the Great Rift Valley moves chess to the backdrop of their journey. Ethiopia is the only African nation to defeat colonization and maintain its timeless culture and written history. 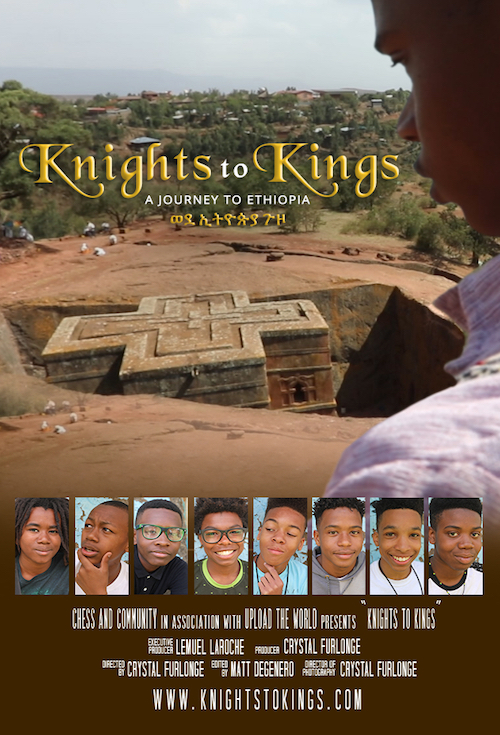 What happens when these Knights come face to face with ancient Kings of Ethiopia? The pride of this nation is as infectious as its kindness and love; the people as beautiful and rugged as the terrain. You, too, will fall in love witnessing the boys transform from Knights to Kings. Chess and Community is a youth development organization that equips, exposes, and impacts youth with real world experiences through mentoring, traveling, and community service. Our programs are designed to expand students' perspectives on life and develop them to become leaders in their communities. Our Motto, "Think Before You Move," challenges youth to take charge of their future and become instruments for change. We offer an array of programs to assist youth in their expansion, while working diligently to foster positive communication and interaction within the Athens community. Free community screenings this AthFest weekend!